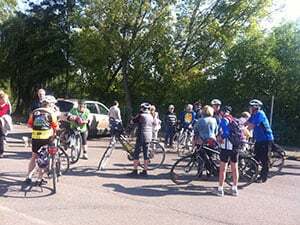 Representing Fordingbridge Twinning Association, Mary and Peter Adams joined 29 cyclists and friends from Fordingbridge’s French twin town of Vimoutiers and the German twin town of Sontra, for the 16th annual Randonnee cycling event. This year the essentially “social” event which was organised by the Twinning Association, was held near Potsdam in Germany in an area near to one of its National Parks. The cycle routes varied from 40 to 60 miles, on mainly designated cycle lanes and across flat terrain. One of the routes took in a tour of Potsdam, where the group enjoyed a day long cruise from Potsdam to Berlin. The group stayed in a small holiday village, similar to Godshill’s “Sandy Balls Holiday Village”.